Ipswich midfielder Andre Dozzell is 16 years, 11 months and 15 days old. 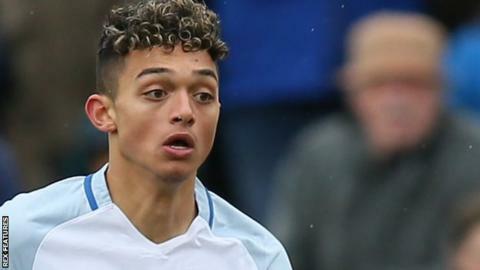 Sixteen-year-old Andre Dozzell scored on his senior debut to rescue a point for Ipswich at Sheffield Wednesday. Freddie Sears came close to giving the visitors an early lead when he forced Keiren Westwood into a fine save. Fernando Forestieri then scored a third goal in five games, latching on to Ross Wallace's ball to put the Owls ahead. Ipswich levelled against the run of play when England U17 midfielder Dozzell headed Liam Feeney's cross home from close range. It is 32 years since Dozzell's father Jason became the youngest goalscorer in the top flight when he also scored on his debut, for the same club, at the age of 16. The result leaves Wednesday five points above seventh-placed Cardiff City in the last of the play-off places with four games to play. The Tractor Boys lie eight points and two places worse off with the chances of a top-six finish looking slim. Wednesday dominated much of the match and could have doubled their advantage when Lucas Joao set up Barry Bannan, but he shot straight at keeper Bartosz Bialkowski. "We played against a strong opponent, one which had ambitions of promotion at the start of the season. We are in a better position than we were before the game. We have a five-point gap over Cardiff. "We'd prefer the win but, for me, it's the way you win, draw or lose. The way we drew today is a positive. We drew because we missed a lot of chances, not because we didn't create any. "We showed we were a consistent team today and played our football. The first 20 minutes weren't great but after that we played good football. We are in a good position now. I talk about reality and the reality is that we must win games. This is a crucial week and we must concentrate on the next game." "It's a good point but it doesn't do us much good apart from that it gives us a bit of comfort that we've got a squad of lads who want to scrap, to play, to fight in a game which could have easily got away from us. "Good genes produce good players and Andre (Dozzell) is a good player. I thought he deserved his opportunity. I always said that if we got to the end of the season and it looked like it had drifted away from us, I'd give him a chance. "I'm always disappointed when we don't meet our expectations, my personal expectations. I thought we could have been a top-six side this season. We've suffered a lot of injuries and it's affected us. We've had a bad four or five weeks. We've had a tough time, and it's finished off our season." Match ends, Sheffield Wednesday 1, Ipswich Town 1. Second Half ends, Sheffield Wednesday 1, Ipswich Town 1. Attempt missed. Jonas Knudsen (Ipswich Town) left footed shot from the left side of the box misses to the right. Assisted by Liam Feeney. Attempt missed. Tom Lees (Sheffield Wednesday) header from the centre of the box misses to the left. Assisted by Ross Wallace with a cross following a set piece situation. Luke Chambers (Ipswich Town) is shown the yellow card for a bad foul. Attempt saved. David McGoldrick (Ipswich Town) right footed shot from outside the box is saved in the centre of the goal. Assisted by Freddie Sears. Attempt missed. Fernando Forestieri (Sheffield Wednesday) right footed shot from outside the box is high and wide to the right. Assisted by Ross Wallace. Daniel Pudil (Sheffield Wednesday) wins a free kick in the defensive half. Corner, Ipswich Town. Conceded by Atdhe Nuhiu. Attempt blocked. Christophe Berra (Ipswich Town) header from the centre of the box is blocked. Assisted by Liam Feeney with a cross. Corner, Ipswich Town. Conceded by Tom Lees. Attempt blocked. Brett Pitman (Ipswich Town) right footed shot from the centre of the box is blocked. Assisted by Luke Chambers with a headed pass. Attempt saved. Ross Wallace (Sheffield Wednesday) left footed shot from the centre of the box is saved in the centre of the goal. Assisted by Atdhe Nuhiu. Attempt blocked. Kieran Lee (Sheffield Wednesday) right footed shot from outside the box is blocked. Assisted by Fernando Forestieri. Corner, Sheffield Wednesday. Conceded by Luke Chambers. Attempt saved. Ross Wallace (Sheffield Wednesday) right footed shot from outside the box is saved in the bottom left corner. Assisted by Gary Hooper. Attempt saved. David McGoldrick (Ipswich Town) right footed shot from outside the box is saved in the bottom right corner. Assisted by Brett Pitman. Substitution, Sheffield Wednesday. Atdhe Nuhiu replaces Lucas João. Attempt blocked. Fernando Forestieri (Sheffield Wednesday) left footed shot from the left side of the box is blocked. Assisted by Gary Hooper. Brett Pitman (Ipswich Town) is shown the yellow card for a bad foul. Attempt blocked. Lucas João (Sheffield Wednesday) left footed shot from outside the box is blocked. Assisted by Fernando Forestieri. Substitution, Sheffield Wednesday. Gary Hooper replaces Álex López. Substitution, Ipswich Town. Brett Pitman replaces Kevin Bru. Corner, Sheffield Wednesday. Conceded by Bartosz Bialkowski. Attempt saved. Lucas João (Sheffield Wednesday) right footed shot from the left side of the box is saved in the bottom left corner. Assisted by Barry Bannan. Goal! Sheffield Wednesday 1, Ipswich Town 1. Andre Dozzell (Ipswich Town) header from the centre of the box to the top left corner. Assisted by Liam Feeney with a cross. Kevin Bru (Ipswich Town) is shown the yellow card. Ross Wallace (Sheffield Wednesday) is shown the yellow card. Attempt missed. David McGoldrick (Ipswich Town) right footed shot from outside the box misses to the right. Assisted by Kevin Bru.